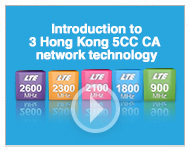 "I can confirm that 3 will be the name for our 3G businesses worldwide. Our name is just one part of our brand. We will stick to our timetable over the coming months, and tell you much more about our approach to our markets and our services when the time is right. Now you have heard that our name is 3, we hope you cannot forget it." 3 will be offering services in the following countries: Australia, Austria, Denmark, Hong Kong, Ireland, Israel, Italy, Sweden and the UK.